White continues to strip away Black's kingside defences. There is no hurry to win back the invested material by taking one of the rooks. In fact White's pieces are doing so well they should stay in the game as long as possible. Note the ease with which they slot into place. Now 22...gxh6 runs into 23 J«Lxa8 ttxaS 24 #13 Ha? 25 »xf6, so instead Black tries to keep what is left of his king's shield intact. 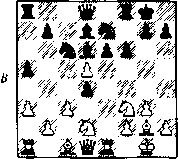 With all the excitement we almost forgot that White's queen has yet to join in the action, and the text prevents entry — for the moment at least — to the kingside. After 23. Cb8 for example, 24 J.xf6 gxf6 25 »g4+ <£h8 26 #h4+ <&g8 27 Wxf6 leaves the black king with no support, and White even has a collection of pawns for the piece. Mission accomplished, the bishop returns to base. Trading is inconsistent: 24...£xf3 25 #xf3 Edd7 (25...2e8 26 Axf6 gxf6 27 Wg4+ wins for White because the rook will be hanging on e8.) 26 AxflS gxfó 27 2c8+. Making way — finally — for the queen to deliver the killer blow. Otherwise White pins the queen. The drawback of Black's setup is that he is restricted somewhat in flexibility of development, and the lack of influence on e4 in turn gives White more choice of how to continue. Also possible is 8 £ih4 followed by 9 f4, as in the game Dolmatov-Lautier, below. Black does not want to be troubled by a future e4-e5 push, and from c7 the king's bishop may more safely observe e5. £>e3 Ad7 15 a4 h6 16 a5 £>c8 17 a6 b6 18 h5 with an unclear position. 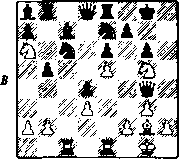 Such a policy as Kaidanov's always runs the risk of wasting four or five moves, after which Black may simply ignore the far-flung pawns and concentrate on play in the centre. Note that 9 e5? ®g6 rounds up the e-pawn. 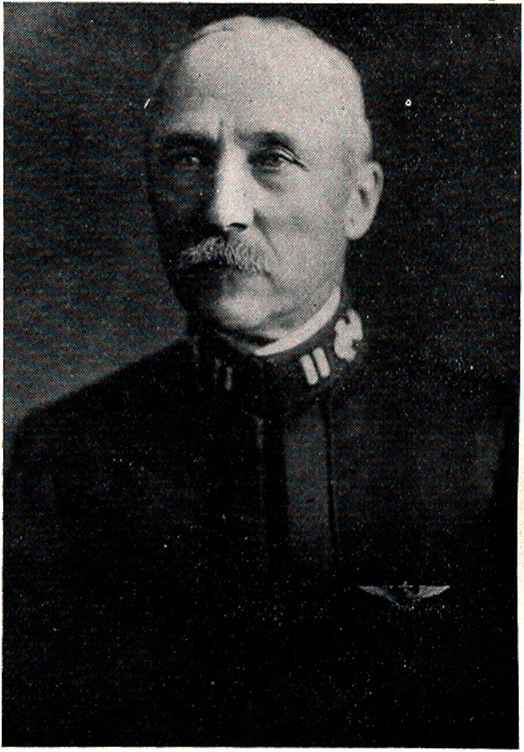 10 .-A.b6? is not at all in keeping with the spirit of the variation, since the bishop will have made several moves to reach this poor square. White does not relish being in a cramped position resulting from ...e6-e5. 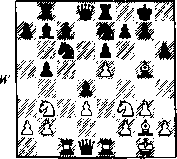 The rook must vacate the hl-a8 diagonal. 13 h4 comes to mind, intending h4-h5 and perhaps even h5-h6. After I3...£te6 White could continue 14 h5 QgxeS 15 £ibxd4, or try the more brutal 14 ^g5 with the idea of 15Wh5. 13...Ab7 at once loses the d-pawn after 14 Axe7 and 15 &bxd4. An interesting 'waste' of a tempo, putting so much pressure on the enemy d-pawn that Black must create a hole on c5 in order to keep it. White also has a worthy — and probably better — alternative in 15 g4, providing a home for the queen's bishop on the h2-b8 diagonal after a subsequent Ac 1 -f4, over-protecting the e-pawn. Now 17 Axe7 2xe7 18 £>c5 Ac8 (or l8...Aa8) is slightly better for Black, as is 17 Ad2 £>g6 18 £)c5 Ac8 19 <&a6 Axa6 20 2xc6 Ab7. White therefore throws down the gauntlet and leaves his bishop on gs. 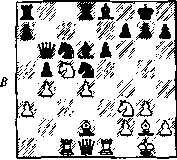 White's plans: 18 Ah4! followed by bringing the queen to f4 or queen-side expansion with a2-a3 and b2-b4 is better for White. Incidentally White need not fear 18...g5 as 19 Axg5 hxg5 20 £ixg5 gives him an advantage. White continues to follow the complicated course. Unwise would be 18 Axe7 2xe7 19 2*6 ttc8 20 £}xc7 2exc7, leaving all of Black's forces wonderfully placed. A risky capture, perhaps, but more promising than 18...2c8 19 £)xc7 2xc7 20 Ad2, when White has a clear advantage thanks to his potentially active and unchallenged dark-squared bishop. 21 »f3 £>xe5 22 #xa8 £sxd3 23 fixc7 #xa8 24 £xa8 <&xel 25 Bxa7. However, 21..,Bf8 should help hold Black's game together, although 22 #g4!? does maintain the pressure. 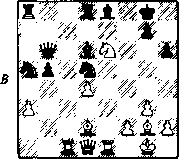 This line could be White's best try for advantage, as in the diagram position Black seems to have a saving resource. side. After 20...<¡feg7 White has a number of interesting ways to continue: 21 #f4 Sf8 22 £lxc7 txc7 23 #xf7+!! Bxf7 24 £ixe6+ <£>g8 25 £ixc7 looks good, and 22 £)xb8 Wxb8 23 ¿xc6!? £)xc6 24 Wf6+ <&g8 25 2xc6! £xc6 26 £>xe6! 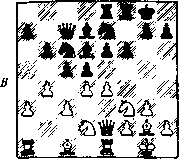 fxe6 27 #xg6+ $h8 28 #h6+ <¿>g8 29 Wxe6+ and 30 Wxc6 gives White an armada of pawns and an initiative for the piece. !Th8+ (24 *h6+ is the last chance to draw) 24...£kg8 25 Wxe5 2c8 wins for Black. 21 ...SfefB could be asking for trouble after 22 f4!? i.g7 23 2xe6!? 2b6! 24 £»5. 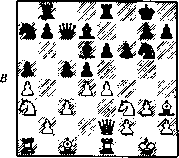 White once again powers into his opponent's position, but Black is ready. Not 24 tfh7+ if)S 25 £ke6+ £f7 26 *xg7+ <£xe6 27 Ah3+ <i>d6 28 *flS+ &c7, when Black has escaped. A fitting result to a good spirited and entertaining game. 1 e4 c5 2 $H3 e6 3 d3 4 g3 d5 5 £lbd2 Jkd6 6 Ag2 &ge7 7 0-0 0-0 8 &h4!? 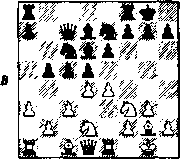 White adopts the hostile plan of pushing the f-pawn which Fischer used to great effect in a crushing victory over Ivkov in 1966 (see below). Much attention has been given to alternatives recently. White has good prospects on the kingside, which is just as well considering the progress Black has made on the other flank. After 14...g6 15 Wg5 Bad8 16 <Sdf3 the threat of Wg5-h6 followed by 5M3-g5 forced I6...£tf5 17 Qxfi exf5 18 #h6 Ae7, when 19 Bel should have been answered by 19...d4!? with a complex straggle ahead, e.g. 20 cxd4 £ixd4 21 Ae3 Wxb2 22 Babl Vc3. Instead 19...Ac8 20 Ae3! Wc7 (20...Vxb2? 21 Ac5! Axc5 22 £>g5) 21 Badl Sfe8 22 Ac5! Axc5 (22...f6 23 exf6 Axf6 24 Bxe8+ Bxe8 25 £lg5 hits d5) 23 &g5 Ae6 (23...ft 24 Axd5+! Bxd5 25 exf6 Bxel+ [or 25,..Bdd8 26 2xd8 Bxd8 27 Be7J 26 Bxel Bd8 27 Be7) should have led to a nice win for White due to 24 £ixh7 Ae7 (24...f6 25 £ixf&+ *f7 26 *h7+) 25 £>f6+ Axf6 26 exf6 etc.